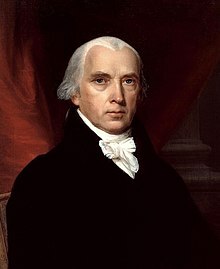 James Madison Jr. (March 16, 1751 – June 28, 1836) was the fourth President of the United States. He was also the most important author of the United States Constitution. Madison was the shortest President, with a height of 5 feet 4 inches (1.63 meters). James Madison Jr. was the eldest son of Col. James Madison Sr. and Nellie Conway Madison. Madison married Dolley Todd (née Payne) on April 18, 1794. Madison started his career in the Virginia state legislature. Madison learned many things from Thomas Jefferson. Madison wanted a stronger federal government of the United States than the Articles of Confederation provided. He was a member of the meeting that formed the current United States Constitution. Madison is called the "Father of the Constitution" because he helped write a large part of it and persuaded people that it was a good one. Madison was elected to the United States House of Representatives. Madison helped write the first laws for the United States. Madison also was the main writer of the Bill of Rights, the first 10 amendments to the Constitution. Madison and Jefferson were good friends and helped create the Democratic-Republican Party who wanted a weak federal government. Madison was selected by Jefferson to be his Secretary of State. Madison was selected by his political party to be the Democratic-Republican candidate for president in 1808. He won that election and the next election in 1812. The War of 1812 started while Madison was president. Madison still hoped for peace, but Congress wanted war so he gave in and approved a declaration of war against Britain on June 18, 1812. People who still wanted peace called it "Mr Madison's War". Madison and his family were forced to flee in 1814 when British forces seized control of Washington D.C and burned the White House, and many other buildings, to the ground. Dolly Madison, his wife, famously saved a portrait of George Washington from the fire. The war caused Madison to want a stronger government than he had before. While he originally was against a national bank, he realized that it was necessary and it was necessary for funding a war. When the charter of the national bank expired, Madison renewed it. Madison retired to Virginia after his second term. Madison died on June 28, 1836. ↑ "James Madison". NPS.org. Retrieved November 4, 2013. This page was last changed on 3 April 2019, at 02:13.